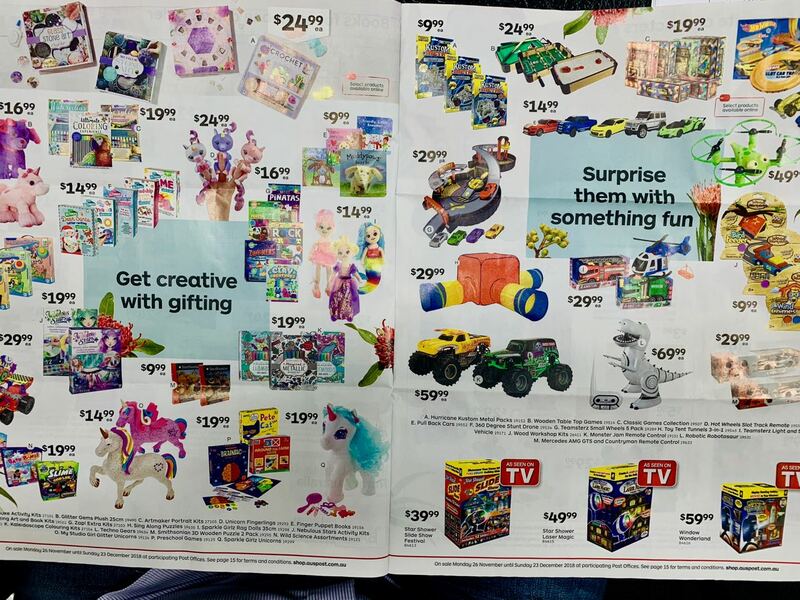 The latest catalogue distributed by Australia Post, a Christmas catalogue, sees, in my opinion, Australia Post overstep its obligations under the Act under which it operates. My concern here is their corporate stores, their government owned stores. These stores are the federal government operating a business, competing with small family run businesses. Take a look at some of what is in this sixteen page catalogue. How do I see this as an overstep? Australia Post is a protected brand, a monopoly. landlords give them preferential treatment, delivering a lower occupancy cost. They land people in their shops because of their monopoly over core products and services. Here is why I think they are in breach of the act. The principal function of Australia Post is to supply postal services within Australia and between Australia and places outside Australia. A subsidiary function of Australia Post is to carry on, outside Australia, any business or activity relating to postal services. (1) The functions of Australia Post include the carrying on, within or outside Australia, of any business or activity that is incidental to: (a) the supplying of postal services under section 14; or (b) the carrying on of any business or activity under section 15. (2) Without limiting subsection (1), the functions of Australia Post include the carrying on, within or outside Australia, of any business or activity that is capable of being conveniently carried on: (a) by the use of resources that are not immediately required in carrying out Australia Post’s principal or subsidiary function; or (b) in the course of: (i) supplying postal services under section 14; or (ii) carrying on any business or activity under section 15. Successive federal governments have permitted Australia Post to take millions of dollars in revenue from small businesses, from family businesses. The situation is getting worse. The behaviour of federal politicians in relation to Australia Post over-reach makes a mockery of the often repeated claims in support of small business. The federal government deregulated newspaper and magazine distribution in 1999 saying that newsagents needed to get into the competitive world. It is a pity that they have not applied the same competition rules to the business they own. Back to the Christmas 2018 catalogue. Almost every page contains items shoppers can purchase from their local newsagency, pharmacy, toy shop, book shop and more … local family run businesses that need to market to attract shoppers for what they sell. Australia Post, on the other hand, lands people for low cost because of their monopoly and then sell what these other small businesses sell, as the add on, as the cream … dining revue from the independent small businesses. It is time for Aussie politicians to walk the walk when it comes to small business retail. Finally, to be clear, I have no concern with what LPOs do in that they are locally owned businesses. My concern here is the corporate stores. With a federal election comming up soon maybe its time for newsagents and other businesses (or whatever lobby groups represent such businesses) to start lobbying the major parties to change what Australia Post is allowed to sell in its stores (or if the legislation/regulations are already there to actually enforce the rules) so that they are no longer given this unfair advantage. Or does Aus Post argue that all the stuff they sell helps keep the costs of sending stuff down and therefore they should be allowed to keep doing it?